Kevin Bridges is no stranger to breaking box office records. When his 2015 tour A Whole Different Story went on sale at the end of 2014 it won awards from both Ticketmaster and Ents24 for the Fastest Selling Comedy Ticket of the year. The tour saw him sell over 500,000 tickets across 145 dates, including an incredible 16 nights at The Hydro in Glasgow. 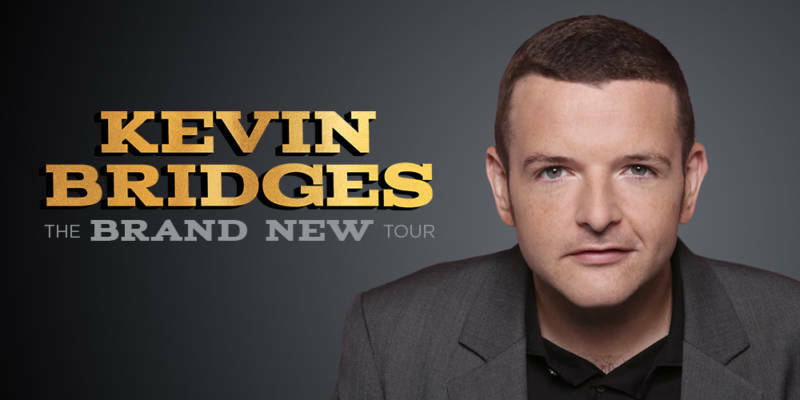 His 2012 tour, Kevin Bridges – The Story Continues… also smashed box office records selling a staggering 45,000 tickets in one day and went on to sell-out an incredible nine-show run at the Glasgow SECC Arena as part of the 136 date tour. Kevin has previously hosted much-lauded documentaries for BBC One including ‘Kevin Bridges – What’s The Story’ in 2012, followed by ‘Kevin Bridges – What’s The Story Referendum Special’ in 2014. In 2014 Kevin also hosted two BBC One stand-up specials on the Commonwealth Games and the Scottish Referendum. Other recent notable TV appearances include BBC One’s ‘Have I Got News For You’ and ‘Would I Lie To You?’, BBC Two’s ‘Mock The Week’, Channel 4’s ‘8 Out Of 10 Cats Does Countdown’ and ‘The Last Leg’ and Sky One’s ‘A League Of Their Own’.